Out front of the former Crosby Library, now Gonzaga University's student center. All images courtesy of Gonzaga University. Spokane, Washington – Spokane is not the kind of location you might expect would give rise to one of the most acclaimed careers in 20th-century entertainment – most big-city Americans would consider it to be in the middle of nowhere. But the prototypical American success story allows for coming from a far-flung place and only occasionally, with a mix of nostalgia and dread, looking back. And Bing Crosby did come from such a town. That explains why, particularly since his death in 1977, this Northwestern inland city, and particularly its largest institution of higher education, Gonzaga University, have drawn attention to the crooner and actor’s modest, middle-class upbringing. His childhood home is, in fact, on the Gonzaga campus, and has long served as the “Crosby House,” a museum of Crosbyana. Much more of the trappings of the idol’s life reside in the Gonzaga archives. Many are held in the Student Center’s Crosbyana Room, while thousands more are preserved in the Gonzaga library’s Special Collections. Unsurprisingly, discoveries of forgotten Crosby artifacts have drawn the marveled attention of national media organizations. But reporters who know their Crosbyana know about his Spokane connections. They knew why a building that formerly housed Gonzaga’s library was called the Crosby Library, and that Crosby helped to raise the $700,000 that built it, in 1957. 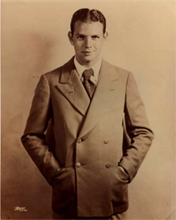 He did that by organizing a television special with an all-star lineup – Louis Armstrong, Rosemary Clooney, Bob Hope, Frank Sinatra, and himself – and then donated the production rights to the university. The Ford Motor Company sponsored the show, and used it as an opportunity to introduce its “car of the future,” the Edsel – hence the shows name, The Bing Crosby Edsel Show. It aired on CBS in October, 1957, and won an Emmy Award. He certainly had been phenomenally successful. His upbringing in Spokane had stood him in great stead. Crosby was born in 1903 across the state of Washington in the port city of Tacoma, 35 miles south of Seattle, but his family moved here to Spokane when the baby Bing was three. He spent his youth and early career in this city, which is known as “The Inland Empire” because it’s the largest settlement on the wind-swept, high-desert, wheat-thatched planes that extend eastward from the Cascade Mountains just east of Seattle, all the way to the Rockies. Crosby was clearly more nostalgic about his hometown than most superstars, because he not only came back, but also bestowed generously on his city. He gave or raised money for many of Gonzaga’s needs, including improvements in the residence of the Jesuits who run the institution. All this is detailed on Gonzaga’s extensive Crosby pages, which draw on Gary Giddins’ Bing Crosby: Pocketful of Dreams (2001) and books, news clippings, and primary sources in the university’s Bing Crosby Collection. The site relates that, by the time of his death in 1977, the entertainer had donated over $1-million to the university, and his will left another $50,000 as an endowment fund. 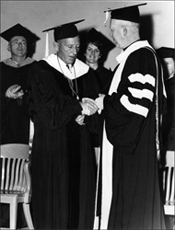 Long before the singer’s death ended his philanthropism, Gonzaga had granted him an honorary doctorate – way back in 1937 – and had later accorded him other honors. The Crosby House, which was originally just off campus but came to be on it with university expansion, was in private hands until 1980. The Higgins family had been only its second owners, after the Crosbys. The Gonzaga Alumni Association bought it for $60,000 and named it the Crosby Alumni House, with Crosby memorabilia on its main floor. More recently, the university took it over. Its centenary is this fall . Close by is the site of Crosby’s elementary school, Webster Grade School, where Crosby got his nickname – his favorite comic-strip character was Bingo from the “Bingville Bugle” strip in a local newspaper. 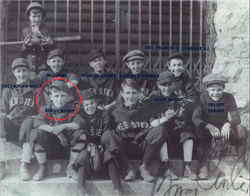 Crosby played baseball at Webster, but was better at swimming: He took seven medals in swimming and diving in 1915. The school is, however, no longer there. It served as Gonzaga’s law school until 2000, but the law school then moved into new quarters, and the building was razed to make way for new housing for the university’s booming enrollment (that, thanks to the national success of its men’s basketball program). Echoes of a grade-school Bing Crosby crooning his first choruses presumably will haunt the new residence hall. Perhaps the campus, too, because once he was done with elementary school, Crosby moved on to what was then Gonzaga High School, and then from 1920 to 1924 he was at Gonzaga University, which shared a building with the high school. He captained the high school’s “Dreadnoughts” football team one year and played on the Junior Yard Association baseball and basketball teams, too. In college he played baseball for a year. Materials in Gonzaga’s collection show that Crosby was a high-school devotee of music, debate, and drama. Elocution classes enhanced the clarity of delivery that was among his career earmarks. He was a member of the Gonzaga Dramatic Club, House of Philhistorians, and Gonzaga Glee Club. Local and Gonzaga publications reviewed him favorably. 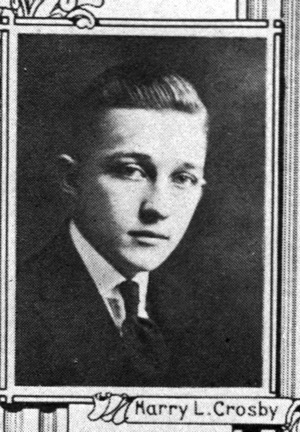 Of his 1923 role in It Pays to Advertise, the city’s newspaper (delivering it was one of Crosby’s many high-school and college jobs) said he and his co-star “carry off all the play’s hilarious moments” and that Crosby “bursts over with spontaneity in getting his amusing lines across the footlights.” The co-star was Michael Pecarovich, who remained a friend and had bit parts in a few Crosby movies. Crosby was clearly enormously energetic in his Spokane days, as throughout his illustrious career. He held high-school and college elected positions. In addition to delivering papers, he worked as a locker boy at a city swimming pool, a lifeguard, a caddy, a janitor at the Everyman’s Club for loggers and miners, an alfalfa-farm worker as well as at the pickle factory where his father was employed as company secretary, a topographer with the Weyerhaeuser Timber Company, and a law clerk. He didn’t hold any of those jobs for long, but they apparently provided him the broad view of everyday life that emerged in his film work. 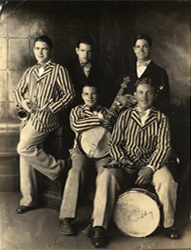 In 1924, while at the university, he fatefully bought a bass drum by mail order. It got him into the band of Alton Rinker, a local high-school student five years Crosby’s junior. The band of high schoolers was the Musicaladers. It was Crosby who renamed Rinker “Al.” The band worked social gatherings and at one point had a weekly twice-a-week gig at the Pekin Café, a high-schoolers’ hangout, and then had an 18-week stint at Lareida’s Dance Pavilion, six miles from Spokane. The band proved more lucrative than Crosby’s array of other jobs, but disbanded the year after he joined it. 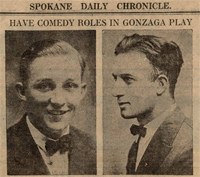 He and Rinker (the brother of stellar vocalist Mildred Bailey) went on to play entr’actes between movies at Spokane’s Doc Clemmer’s Theater, which is now the Bing Crosby Theater. That was the first time Crosby was a regular singer, and the stint lasted five months, long enough, and for enough money, that he left Gonzaga before his final year of pre-law education. He left to sing. 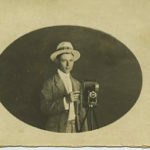 By then Spokane had provided him a varied apprenticeship in the arts, but also in life. 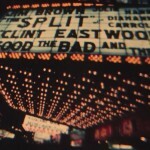 He had become about as all-American as he needed to be to launch a career of immense popularity. He did not return to Spokane for 12 years, then as big an entertainment star as any in the United States. He made several more trips here during his career. And he continued to support Gonzaga. In 1961, for example, he narrated the 30-minute promotional film Take Gonzaga, to promote the university’s 75th anniversary in 1962. It shows him dispensing advice he had not taken, himself: He advises a young caddy to get a college degree before trying to make it on the golf circuit. Come here today, on a campus visit, and you will find a near-life-size statue of the crooner and film idol, in golf gear. It is out front of the old Crosby Library, now the Student Center. Erected in 1981, the statue is the work of a local artist, Deborah Copenhaver. On special occasions, such as the 105th anniversary of the crooner’s birth in 2008, Gonzaga staff pull out one of three replicas of Crosby’s trademark pipes, and screw it into the mouth of the statue – not because leaving a pipe there permanently might encourage undergraduates to smoke, but because otherwise light-fingered students tend to make off with them. The statue was the setting, back in 1993, for the United States Postal Service’s unveiling of its Bing Crosby stamp, part of its Popular Singers series. Gonzaga’s collection of Crosby, in its various locations on campus, totals more than 25,000 items and is the world’s largest public collection of Crosbyana. 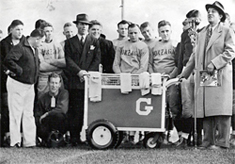 Not only Crosby gave memorabilia to Gonzaga; so did family members, friends, and associates. But Gonzaga also pursued other avenues. 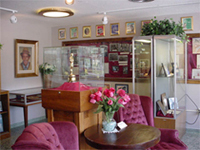 In the early 1990s, it doubled its collection by acquiring the holdings of the Bing Crosby Historical Society, in Tacoma, which was dissolving. The organization had dated from 1977, the time of Crosby’s death, and had boasted among its members Ronald Reagan and Queen Elizabeth II. It’s thanks to acquisitions like those that the student center’s Crosbyana Room is so distinctive. The small museum is open year-round to students and staff, as well as to fans. Each year, 3,000 or more come from around the country and abroad. In the special-collections area of the library are several shelves of additional material, from scrapbooks kept by fans to boxes of movie stills and scripts. Gonzaga also has a board game called “Call Me Lucky” that Parker Brothers released in 1954 (the year after the publication of Crosby’s autobiography of the same title). About 1,000 Crosby long-play and 78 R.P.M. records are in the climate-controlled stacks, as are hundreds of recordings on vinyl or glass discs of Crosby radio shows. His book cast Crosby in a better light than some others published after Crosby’s death. Some claimed that Crosby and his publicists cooked up his affable image. 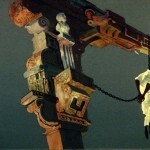 One Crosby son portrayed his father as rotten and violent. The Gonzaga priests who knew Bing best are, of course, long dead. And students barely know who he is. It was not so at the time of Crosby’s death on a golf course near Madrid in 1977; then, Gonzaga lowered its flag to half-mast and thousands paid homage at a memorial mass at St. Aloysius Church, a block from Crosby’s childhood home. He had served there as an altar boy when he was 13. For Stephanie Edwards Plowman, the special-collections librarian in charge of the Crosby archives, and her colleagues, the Crosby archives remain a proud legacy and research resource. Tourists still come here to the campus to visit the library’s Crosbyana Room, and to take selfies in front of the Crosby House. Among celebrity drop-bys of recent years has been Regis Philbin, in town for a casino appearance. The collection is far from Gonzaga’s only cherished one. Also in the vaults is a rare-book collection with items dating back to 1475, as well as Jesuit missionary archives that detail many now-extinct American Indian languages. And, naturally Gonzaga is not the only institution to seek to keep the Crosby croon going. The Crosby family, for example, has taken an increasing archival role. At the request of a curator at Bing Crosby Enterprises, in Malibu, Gonzaga archivists are going through material in library’s their basement vault to find radio discs to digitizing them for the library as well as Kathryn Crosby, the singer’s second wife. 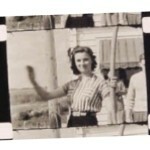 They will augment her large collection of her late husband’s personal papers and photographs. Crosby Enterprises is coordinating family activities. Its website’s Video Vault shares many video clips – commercials, tv spots, public-service announcements, and the like. 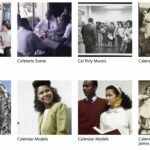 A similar Audio Vault is also online, as well as an extensive collection of photographs and facsimiles of magazine articles, posters, sheet music, and the like. Master tape recordings and were dusty on the shelves in tin cases. we both said these should be converted to DAT cassette tapes back then. I am hoping they were taken care of by someone. It was some real Spokane priceless history!